I’ve had a busy January. Apart from the usual tax return fun and getting things in order after the holiday season, I’ve also had other things to preoccupy me. Like, getting married. I found the whole wedding process incredibly not-fun and often frustrating. As someone who’s never dreamed of having a wedding, I was thrust into a world where I was supposed to have opinions on flowers, colour schemes, table plans, menu options, and cake flavours. Even more disturbing, I found myself in a world where brides were consistently depicted as young, slender, and blonde. It was assumed I’d diet to fit into a heavy, corseted dress and that I’d overdye my hair to a natural colour. Encountering the wedding industry was a reminder that I’m lucky to work in knitting: a community that has its fair share of problems (to say the least) but does not feel as patriarchal as the giant wedding industry. So, here’s what we did instead. I designed and knitted my own shawl using Rowan Kidsilk Haze. I used to work for Rowan years ago, and KSH is perfect for a soft, light and warm shawl. Exactly what I needed for a cold January day. I’ll write more about the shawl at a later date. I finished designing it last year and always intended to release it as a pattern before deciding it would make a beautiful wedding shawl for myself. The dress is another story. I originally intended on making a dress for myself (too many frustrating visits to bridal salons), but after playing around with the toile and coming up against work deadlines, I decided to let a proper dressmaker have fun with it. I designed the dress itself and was inspired by Hedy Lamarr’s star dress, 1970s maxi dresses, and Gucci’s current maximalism (as exemplified beautifully by Lana Del Rey at the Grammys). I did have another plan at first, but I’m glad that I decided to go with my gut instinct. I kept jewellery to a minimum wearing my grandmother’s necklace (with my late father-in-law’s ring tucked behind the flower pendant), bracelets gifted by a dear friend, long pearl earrings and a simple headband. I don’t tend to wear jewellery at all, so I felt that was a lot! The wedding rings were designed and made by my brother-in-law. And, well, I married a Scotsman who obviously wore a kilt! David looked very handsome. We had a low-key time with a small civil ceremony in front of our closest family and friends. It was important to me that the ceremony was as intimate and personal as possible — especially as I had found the whole planning process very intense and unpleasant. I remember the ceremony as being full of laughter and joy. We had written our own vows and had a close friend do a reading. David and I have been together for 13 years and it was just lovely to look back at our years together as well as look ahead at what is to come. As I said at one point: we do not complete each other, we complement each other. One of the greatest joys of the day was welcoming friends to join us for the evening celebration. We were lucky enough to have friends join us from all over the world: Scotland, England, Denmark, Sweden, Bulgaria, The Netherlands, Turkey, Canada, and the US. It was a small gathering yet again, but having all the people we love in the same room all at once was worth all the stress and frustration. I am not a huge fan of crowds, so while we could have invited three times as many people, I knew it wasn’t an option. Special thank yous go out to Singl-End Garnethill for hosting us, Angela & Billy for DJing, and Helen for the star-strewn cake. Having pals do their thing as part of our day felt very cool and apt. 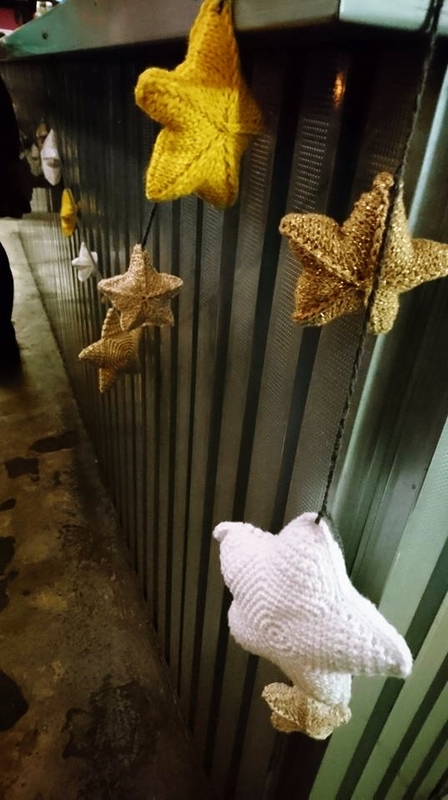 Speaking of pals doing their thing, amazing knitters and crocheters from across the world came together to make us stars! I received a massive crate full of stars - all the sizes you can imagine - and made them into garlands which we hung in the evening venue. It was a perfect reminder that David and I are surrounded by creative, talented people with big hearts. Some of the makers were present and took great joy in finding their own stars; other makers simply wanted to gift us something wonderful. I thank you all. We are planning on turning all the stars into a beautiful wall hanging. A few people have asked me why David and I decided to get married after being together since 2005. In recent years David and I have experienced some sad losses in our immediate family and also seen the world become a harsher place. We thought it was time to add some love and joy to the world — particularly for our families and close friends. This celebration was more than just David and I finally signing on the dotted line: it was a celebration of the people we love and cherish; the people we miss so much and forever will hold in our hearts. And that is what love does: it makes you see that the world is so much bigger than just you and yours; it opens up hearts and minds. Finally, some small tips for anybody who’s contemplating the whole marriage thing. Avoid the massive wedding industry complex as much as possible. They will feed on your insecurities and make you feel inadequate no matter what. There are a myriad of ways of having a wedding, so stick to what feels right and true to you. Getting married on a budget is more than possible. We didn’t have flowers (apart from two bouquets which I arranged myself), we didn’t hire an expensive photographer to document the day, we didn’t spend a huge amount on outfits (my fake fur coat was a wonderful vintage find, for instance), and I did my own makeup. Don’t feel like you have to make everything yourself because you might be a maker. It is fine to delegate and get other people to do things they’re probably better at than you. Don’t feel like you have to confine yourself to what a wedding should look like. You don’t need chair covers, favour bags, confetti, Mr & Mrs/Mrs & Mrs/Mr & Mr signage, or eight bridesmaids. My original dress plan was mustard yellow with fuchsia accents. Between the ceremony and the dinner, a bunch of us went to a downtown bar/art gallery where we had drinks and snacks while we dissected the state of the world. David and I want to thank everybody who’s been in touch to offer their congratulations. It is so lovely to hear from you all and I hope that our mission to spread a bit of joy into the world has spread to you (even if just for a minute). I shall return with knitting content very soon (because I have been knitting quite a bit). Older PostDear 2018, We Need To Talk.